Well 2014 round 1 is complete. Saturday served up some lovely weather for racing and the times confirmed it. Everyone has picked up their game from last season and I was astonished at their pace. I tried my hardest to keep up after no bike time since last october at cadwell and not riding my bike in any shape or form since rebuilding the engine, front brake calipers or master cylinder. As it turned out the only problem I had was the gear selector being too high. This compromised my qulifying but I still managed to set a time of 57.122 meaning I started in 23rd. Race 2 was even faster and I broke my own personal best time with a lap of 56.055. The front runners were in the 52’s. Race 3 was on sunday morning after a storm over night. The track was sodden but the rain was fine. The race was a blast and I loved every second of it. Everyone was running wet tyres but I felt like I was riding a different circuit. At one point it appeared that everyone was twice as cautious as me. I moved up to 13th in this wet race. 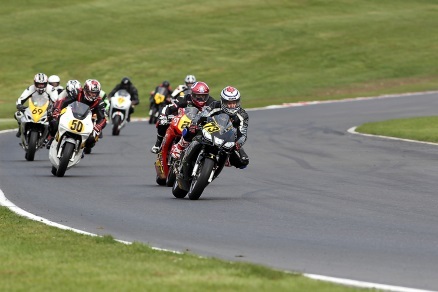 Race 4 on sunday was on a dry track with dry tyres but I think everyone knew it wouldnt end in the dry. We completed 4 laps and the track became so slippery in the fourth that three riders fell and the red flag came out.